Happy New Year 2019 Wishing Script - Agar aap Festival Wishing Website banate hain to apke liye Happy New Year 2019 Wishing Script hai jisko Happy New Year 2019 Wishing ke liye use karke WhatsApp Viral Website create kar sakte hain. First of all, Yeh bata dun ke Happy New Year 2019 Wishing Script Hindi language me hai or kuch images use ki hain is Script ko Beautiful banane ke liye, And yeh Happy New Year 2019 Wishing Script completely Pro Script hai or is Script ke kafi ache features hain. 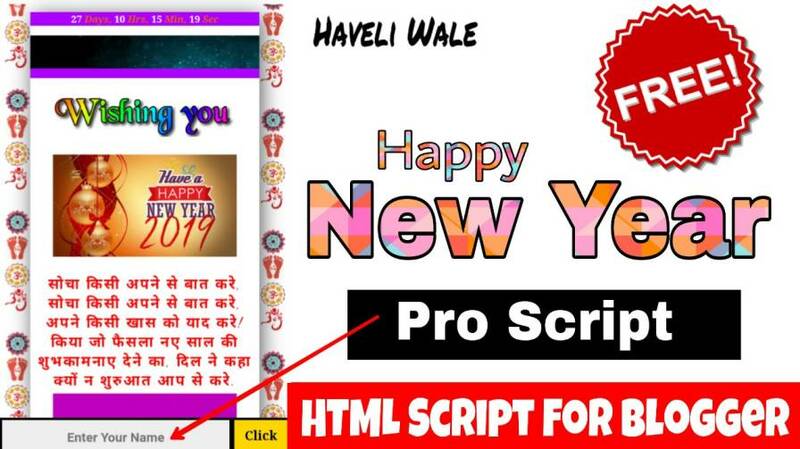 Happy New Year 2019 Wishing Script ko HTML coding me Pro Script banaya hai, Yeh Script Pro is liye hai B'coz is Script ko user apne name ke saath share kar sakta hai, It means jab user apna name enter karega then share karega to Script Name ke saath share hogi. Happy New Year 2019 ki Wishing Script completely AdSense Friendly hai that's why is Script se AdSense ki Earning increase hone ke ziyada chance hai, Also Script sabhi Sizes ke Ads Support karti hai. Is Script me kuch Wishing images bhi use ki hain or yeh images aap change bhi kar sakte hain agar apko coding ki thori knowledge hai B'coz is Script ki coding bilkul Easy hai. Happy New Year 2019 Wishing Script me WhatsApp share button bhi milta hai And yeh Script bohat Light weight hai jis se Wishing Website ki Speed High hogi or user ko koi Problem nahi hogi. Happy New Year 2019 Wishing Script ke main Features ka overview neeche btaya hai. Happy New Year 2019 Wishing Website ko Viral karne ke liye kafi Easy methods hain But ziyada Viral karne ka 1 Easy Method neeche btaya hai, And Viral karne ke liye again & again Groups or Contacts ko message forward karna hota hai. Agar apko Festival/Happy New Year 2019 Wishing Script ko Blogger par Setup karne nahi ata to aap How to Setup Festival Wishing Website in Blogger ko Read kar sakte hain, Yahan bilkul Easy Method se Blogger me setup karna btaya hai or saath he Wishing Website me AdSense or other Ad Network ke Ads lagana bhi btaya hai.